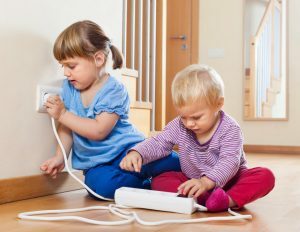 For your own peace of mind and your children’s safety it is essential for you to make them aware of safety and how to handle emergency situations from a young age. Children of all ages must know how to use a telephone and where to get help in an emergency. Let them memorise important numbers. If they can read, display emergency numbers close to the telephone where they can easily find them in an emergency. Load important and emergency numbers on the housephone and on everybody’s cell phones. They must be able to identify an emergency and react to it. Children must as soon as possible be able to give their full names and surname, age, address and contact details of their parents in the event of an emergency. In no circumstances may children open the door to strangers, not even if the parents are at home. In no circumstances may they speak to strangers in public or get into strange cars. They are not meant to be played with. Electrical power points, hot stoves and hot-water taps are dangerous. Children must know what to do if a fire starts in the house. Warn them about possible natural dangers, such as snakes and spiders and other pests, and other venomous creatures such as scorpions and venomous frogs. Some plants and certain types of mushrooms that grow in the wild are dangerous and can make you very sick and even kill you. Store them out of reach of children. Warn them that they are dangerous so that they know what to do should they swallow it. Other medicines are dangerous even to touch. Children can drown in a few millimetres of water. For this reason children under the age of six should never be left alone in a bath or at a swimming pool. Teach them to swim as young as possible or even just to float on the water. Also teach them to feel the temperature of the water by hand before getting into a bath to prevent scalding. Electrical appliances such as cell phones, hair driers or heaters may not be used near water or with wet hands. Children who are allergic to certain foodstuffs must know and understand why they may not eat them (for instance that it can make them very sick or even kill them). This will help them to make informed choices even if they are alone at home or visiting friends. Teach them how to play safely on playing apparatus at home and also in public playgrounds. It is, for instance, dangerous to climb up the bottom of a slide while a friend wants to slide down. They may not run past a moving swing. And they should not push around friends because they can get hurt. Teach your children to cross streets safely: do not run, make sure that there is no approaching traffic, always cross the street at a pedestrian crossing, a stop street or a traffic light (when the light is green). Do not run across the street after a ball or pet. Teach them what to do should they get separated from you in a store or public place. Children do not see furniture as things that could cause them harm. Warn them that climbing onto furniture could cause serious injuries because it could capsize or they could fall off. Forbid them to play on furniture. How do I teach my children safety measures? Children must realise that safety rules are not intended to spoil their sport. Instead of saying: “You will do this because I say so”, give them valid reasons. Do it in such a way that you do not scare the children. This is more than just a lot of rules. Guide them so that they will eventually instinctively know situations are unsafe. One way of doing this, is by practising. Use scenarios and encourage them to come forward with safety solutions.